I walked into the Havas offices in London on Wednesday afternoon a complete bag of nerves. I’d spilt coffee, got lost and walked the wrong way up some stairs before I found the basement where the unrecruitment for the 14 internships was taking place. Immediately I relaxed slightly, the room was large, open and people were walking around talking and laughing. This didn’t seem like a normal job interview. We had to pick a quote from a selection on the floor – one that we felt the biggest connection to – and get into a group to make a presentation. My group was friendly, and we quickly got stuck into the task. The next two and a half hours continued the relaxed, fun and interesting activities designed to make us think – in between which we were given information about the roles and also given the opportunity to reflect on our own skills and relevant qualities for the internships. This was a really helpful process, as it meant that I could get into the heart of the job descriptions, and how I matched up to it. As job-seekers, all too often we’re met with a list of desirable skills and experience, and more likely than not as students or graduates we simply don’t posses all of them. But when you think about the attributes and personality needed, that is when you discover if you have the right mindset for the role. Internships are all about learning, and a two way relationship where you contribute to the organisation, but also gain something back. If you don’t have the right sort of personality this won’t be very effective, so it was great to actually have an opportunity to think about how I matched up to what was wanted. At the end of the day we were told that everybody was through to the next round, and it was up to us to decide if we wanted to come back or not; based on what we had learnt about the roles and how well suited we thought we were for them. I went home feeling so much more positive about myself, my strengths and skills, and my ability to enter the working world after university. I spent a while thinking about if I wanted to go back on the Friday; just from the short session I felt more confident and empowered as a candidate and as a person. Eventually, I decided that I was going to go for it and see how far I could get in this amazing process. Friday started with a few little exercises, and then did one of the most difficult things I’ve ever done – staring at someone for 30 seconds whilst they talked, with a completely blank and neutral facial expression. It sounds pretty simple, but the desire to nod or smile or reply is really hard to ignore! It was all about being an engaged and effective listener. Sometimes we can get very distracted whilst listening to someone, thinking about our reply, the bit of fluff on their jacket or even what we’re going to have for dinner. By being forced to focus entirely on what the other person was saying, we could really take it in. It was all about being an engaged and effective listener, and it was really interesting to try. The main task for the day was to split into six groups and come up with a 20 minute presentation to present to The Spring Project based on our findings from a set of data. We had two data analysts, two creative content designers, two social media gurus and two writers in our team, and we quickly got to work on a plan. It was like something from The Apprentice, and I was really excited to get stuck in. I came up with the overarching concept for our campaign proposal: Discover. I thought this up as over the whole unrecruitment process I had discovered so much; about myself, my skills and strengths, about the internships and the companies offering them, and about The Spring Project and Enternships. During the pitch I spoke about the “discover” concept and how we would apply it across the marketing and social media channels to engage people. At the end of the day I was so much more confident in myself, I had taken a lead within my team co-ordinating everyone and helping to bring all of the separate parts together to create the final pitch. I thought that the quality of the other candidates was amazing, and whilst I was incredibly hopeful I’d be offered a position, realistically I knew there was a good chance I wouldn’t. However either way I felt like the experience had been incredibly positive and I was proud of everything I’d done. Fast forward a few days, several emails and phone calls, and a lot of nerves and I was incredibly pleased to find out that I had in fact been chosen and offered an internship, which was the perfect end to an unforgettable experience. The obvious thing which I’ve got out of the unrecruitment process is this amazing opportunity, but I cannot stress enough the confidence, insight and positivity which I picked up along with it. 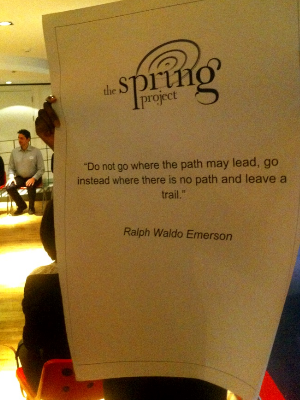 I would really recommend The Spring Project to all graduates and students, and also Enternships, who are pioneering the employment market for young people with their schemes and ideas. Thank you so much Enternships for giving me this amazing experience, and ultimately helping me to land a dream internship!